Florence Nightingale is widely considered to be the founder of modern nursing education through her efforts to start The Nightingale School of Nurses that opened in 1860 and continues today at Kings College London. Florence Nightingale rose to prominence through her singular efforts in taking care of soldiers during the Crimean War. She became known as the "Lady with the Lamp" due to her habit of making solitary nocturnal rounds with a hand-held lamp to check on her soldier-patients at night. Her lamp continues to be a very important symbol in nursing education today. Upon return to Britain after the war, she focused on training nurses as well as working diligently to improve sanitary conditions in Britain and India. She was a pioneer of using statistics and graphics to investigate mortality and disease. 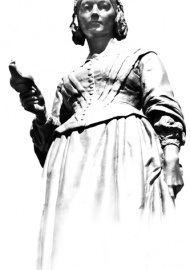 The image used in this website is a statue of her located in Waterloo Place, London. This image is an electron microscope view of the H1N1 virus which shows its spherical structure and the spiked glycoproteins extend out from the lipid membrane that envelops this virus. These glycoproteins are known as neuraminidase (NA) and hemagglutinin (HA). These glycoproteins are very important for disease management in that these are the proteins against which vaccines are developed and against which the current medications of Tamiflu and Relenza act. 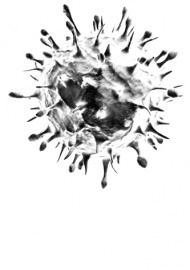 The virus attaches to human cells via the hemagglutinin protein spike. Influenza viruses are named for the glycoproteins that are expressed on their surface. There are 16 HA subtypes and 9 NA subtypes. However, historically only H1, H2, and H3 and N1 and N2 have infected humans with any severity. 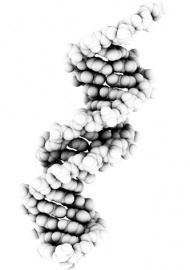 DNA contains the genetic instructions for most living organisms on earth. The code made up of a repeating sequence of base pairs that are held together in a long polymer of sugars and phosphate groups held together by ester bonds. This simple structure repeated over and over forms the iconic shape of the double helix that was discovered by James D. Watson and Francis Crick in 1953 by using X-ray diffraction to obtain graphical images of molecular structure. They based their structural hypothesis on a famous X-ray diffraction image famously known as Photo 51 whose image is widely available on the internet. The photo was actually taken by Rosalind Franklin and considerable controversy exists over who really discovered the structure of DNA. Nonetheless, Watson and Crick were awarded the Nobel Prize in Physiology or Medicine in 1962 for their discovery of DNA's molecular structure. The history of Gross Anatomy traces back to 1600 BC in Egypt with early papyrus recording of major anatomical structures. The most famous ancient anatomist was Galen who used animal vivisection to derive general principles of human anatomy and wrote a textbook that remained relevant for 1500 years. It wasn't until the 16th Century that Vesalius challenged many of the principles from Galen and advanced the science of anatomy. Throughout the 17th and 18th Centuries most major artists studied anatomy and even participated in public dissections to advance their abilities to draw the human form. 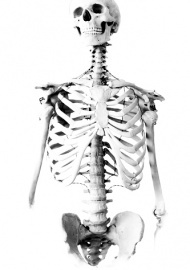 However, human bodies remained in scarce supply until English Parliament passed the Anatomy Act of 1832, which greatly opened the availability of bodies for scientific study. The seminal work of the time was Gray's Anatomy that was first published in 1858 and produced a single massive volume of anatomy intended to assist contemporary doctors. For most of us currently practicing medicine, Frank Netter was the anatomist and medical artist who taught a generation of physicians with his beautiful and thoughtful images. Today, most students learn anatomy from the Visible Human Project that is a virtual 3-dimensional atlas of normal male and female anatomy created by the National Library of Medicine. 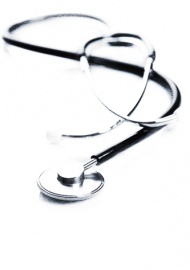 The stethoscope is considered the symbol of the healthcare profession. The stethoscope was originally invented by Rene Laennec in 1816 France and it began as a hollow wooden tube similar to an ear trumpet. It wasn't until the 1940's that a new binaural flexible stethoscope was invented by Rappaport and Sprague that became the industry standard during the 50's and 60's. The single tube acoustic stethoscope that is favored today was invented by Dr. David Littmann and his name has become synonymous with the tunable cardiology style stethoscopes favored by most physicians. Syringes have been around in various forms since Roman times. Their original use was as a suction device to treat various medical maladies. 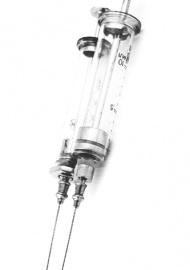 It wasn't until the mid-1800's that syringes were used to inject medications into the body. The first plastic syringes were patented in the US in 1974 and they have become a nearly universal tool in healthcare. Syringes are rumored to have been named after the Syrinx which is a mythological nymph that was transformed into water reeds that ultimately were used to create pipes used by the Greek god Pan. The Caduceus which is the image used in this web has become strongly associated with "medical" organizations over the years. Much of this relationship came about by association with the Greek god Hermes who is linked strongly with alchemy and by derivation, pharmaceuticals. 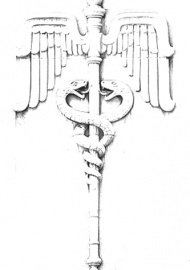 Historically the Caduceus has strong links to the occult arts. The strongest bond between medicine and the Caduceus occurred in 1902 when the US Army adopted the Caduceus as the official symbol of the Army Medical Department. 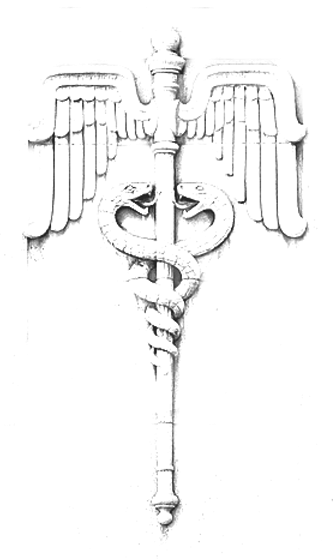 However, the historically true and accurate image for medicine is the Staff of Asclepius, which is slightly different in form. This image has a single snake wrapped around a rough-hewn wooden staff that was carried by Asclepius who was an ancient Greek physician who came to be defied as the god of medicine. Early medical schools were called Asclepions. In Greek myth, Asclepius had three daughters named Meditrina, Hygieia, and Panacea who collectively represented medicine, hygiene, and healing. The importance of Asclepius to medicine is highlighted by the fact that the traditional Hippocratic Oath taken by all physicians begins with "I swear by Apollo, the healer, Asclepius, Hygieia, and Panacea, ...."